AirAsia mounted earlier today its inaugural flights to Taipei and Singapore, marking an expansion that is seen to boost tourism and increase job opportunities, officials said. 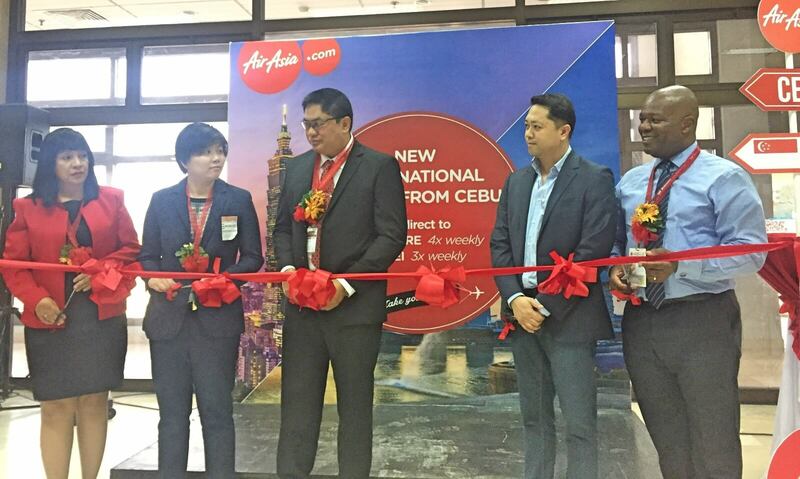 Monreal said during the launch at the Mactan Cebu International Airport (MCIA) that air travel is “already a necessity” nowadays and the massive AirAsia network provides “true connectivity” in the region. NEW ROUTES. Launching the new AirAsia routes to Singapore and Taipei are (from left) DOT 7 officer in charge Judy Gabato, Singapore Tourism Board area director Lael Loh, Philippines AirAsia Director for Flight Operations Gomer Monreal, GMCAC President Louis Ferrer and Chief Executive Advisor Andrew Harrison. AirAsia launched today its thrice weekly (Wednesday, Friday, and Sunday) Cebu-Taipei route and 4 times weekly (Monday, Wednesday, Friday, and Sunday) Cebu-Singapore route. Lael Loh, Area Director of the Singapore Tourism Board, described the new Cebu-Singapore route as a historical milestone that “couldn’t come at a better time.” She described Philippines, especially Cebu, as an important market for her country. Loh said the Philippines is the 7th biggest tourism market for Singapore. Cebu, she said, comes next to Manila in terms of market share. In 2015, over 650,000 Filipinos visited Singapore. Of the number, over 33,000 came from Cebu. “For music lovers and Cebuanos are huge music lovers, we have a lot of blockbuster concerts and music festivals this coming 2017,” Loh said. She mentioned such acts as Coldplay, Guns N Roses, and Metallica who are scheduled to perform in Singapore.